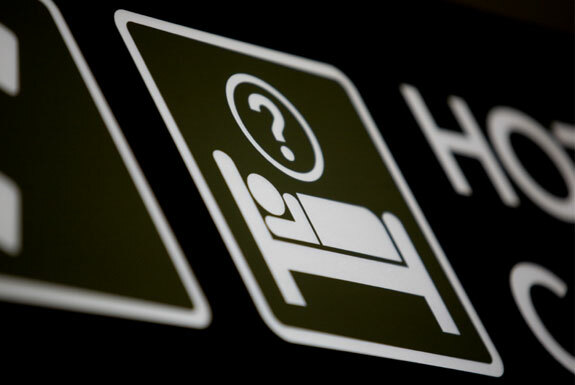 Airport hotels have got a bad name. You might have spent the night in a soulless concrete box by the tarmac, its hallways lined by hollow-eyed passengers en route to a better place. But it doesn’t have to be like that. The next time you’ve got a stopover between connecting flights, you can spend the night in heavenly comfort at one of these luxurious airport hotels. You might be tempted to book a room even if you aren’t using the airport! 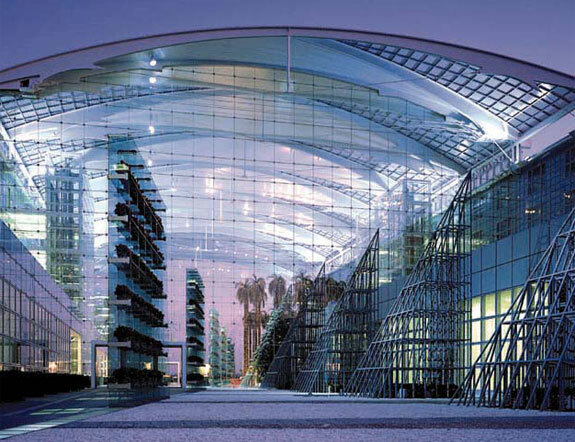 This 5 star hotel is located right beside Terminal 1 at Munich Airport and is one of the most spectacular airport hotels in the world. 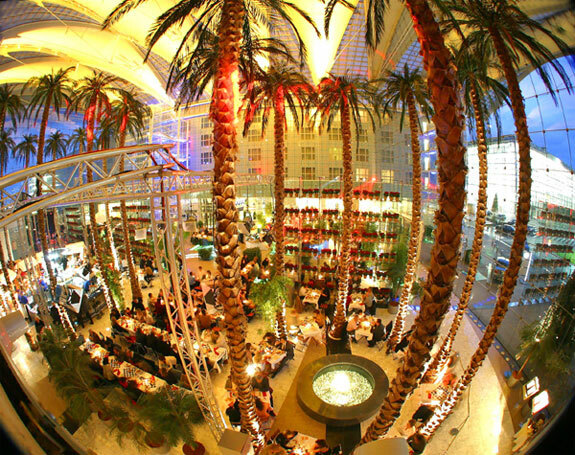 Its central feature is a 24 meter (79 foot) high glass atrium, filled with palm trees and grass-covered pyramids to create an oasis of calm. At night, it is lit up with changing themes and colours. The guest rooms and suites have state-of-the-art soundproofing to ensure a good night’s sleep, and special touches like granite bathrooms and ergonomically designed chairs. A concierge floor offers complete exclusivity and privacy to the rich and famous. There is a fine dining restaurant on site which stages special events like “Blind Date”— a chance to appreciate the food by eating in complete darkness, served by blind waiters. 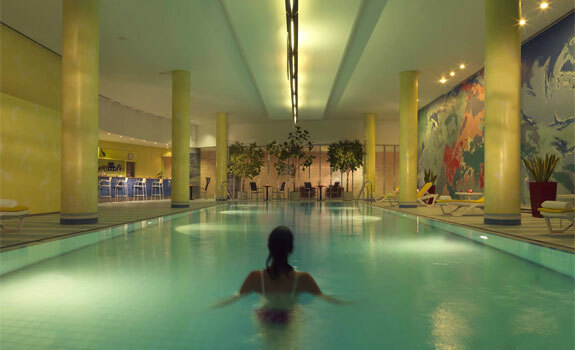 The hotel also features a futuristic spa, with a sauna, steam bath and solarium. Remember, an airport hotel doesn’t have to be right beside the runway. Casting the net a little wider can turn up a fabulous alternative for an overnight stay. This hotel has direct motorway access to Frankfurt International Airport, so you could be there within a few minutes of leaving the terminal. 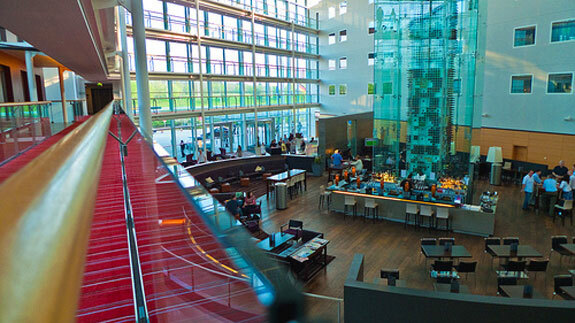 The only circular hotel in Europe, it is a beautiful glass monument to modern architecture. The guest rooms and suites are decorated in 4 different themes—“at home”, “chic”, “fashion” and “fresh”. Floor to ceiling windows offer spectacular views over the city and there are special features such as under-floor heating and designer wallpaper. The Presidential Suite represents the ultimate in luxury accommodation with 130 square meters (1,400 sq. feet) of space, parquet floors and leather sofas. 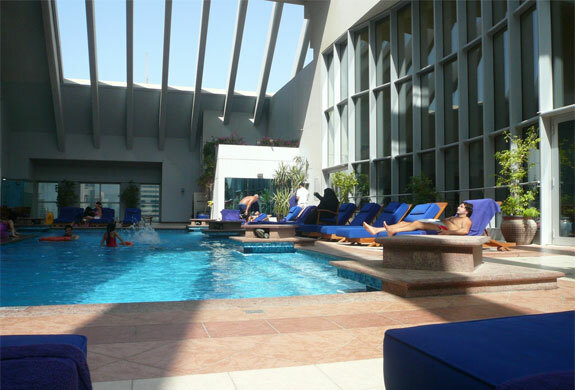 Located a few minutes from Dubai International Airport, this 5 star hotel combines Arabian luxury with Thai hospitality. Guests are picked up at the airport in a chauffeur-driven limousine and attended to by a butler when they arrive at the hotel. Complimentary drinks are available all day and guests will also be offered afternoon tea. They can attend a banquet in the ballroom, take a swim in the rooftop pool, or enjoy a meal in the signature restaurant, which is the first to bring Royal Thai Cuisine to Dubai. 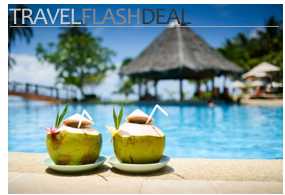 The top-class rooms and suites are kitted out with espresso machines and mahogany furniture. A member of staff will attend to every need, including unpacking suitcases, laundering clothes and polishing shoes. 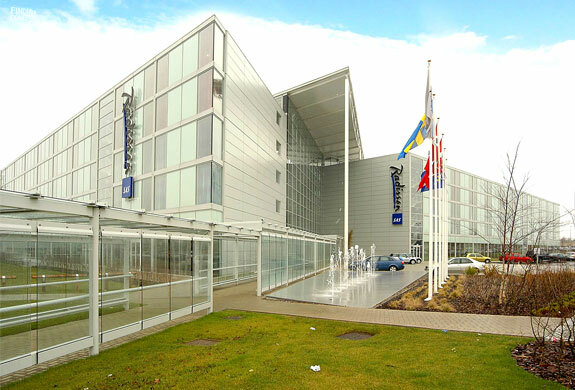 This hotel is a short walk from the terminal at Stansted Airport and, from the outside, it looks like any other quality modern hotel. But venture inside, and you’ll find something special. The rooms are arranged around an internal courtyard, which is flooded with light through the glass walls. At the centre is Europe’s first “wine tower”—a 13 meter (43 foot) high structure holding 4000 bottles of the finest vintages. “Wine angels” fly up and down it on wires, performing acrobatics and collecting your chosen bottles. 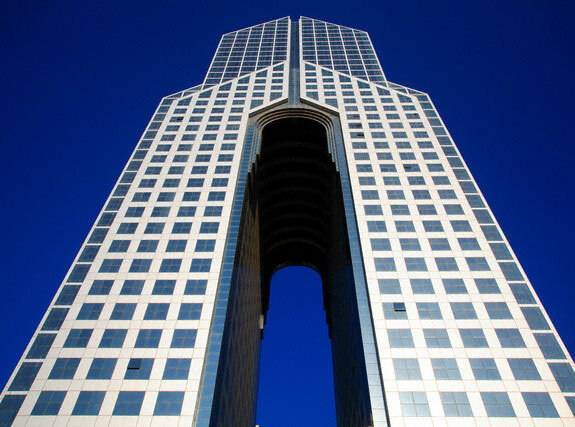 At night, they are silhouetted against the glass tower, which radiates a luminous blue light. Some of the bedrooms look out over this internal courtyard. Guests can choose the decorative theme of their bedroom – either Chili, Ocean or Urban Style, and there is a luxurious Health and Fitness club on site. 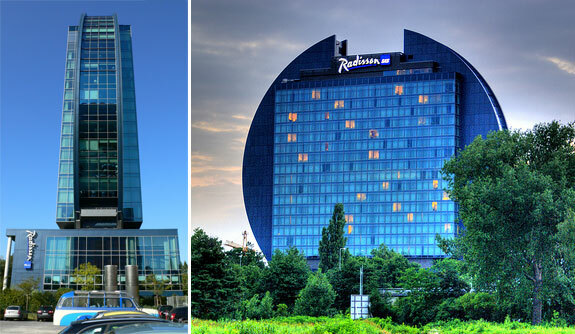 This hotel is connected to the arrivals hall at Dusseldorf Airport. It’s appointed with all the facilities you would expect in a top-class hotel, but what makes it stand out is the 10,000 square metre roof garden. It’s an unusual place for a postprandial stroll, with an amazing view! If you don’t feel like going outside, you can still enjoy this feature from the gym, which overlooks the garden. The Mediterranean restaurant also makes the most of the skyline, with floor to ceiling windows. Another dining option is found in the rustic-style tavern, which serves Bavarian specialities. The bedrooms and suites are furnished in luxury fabrics like beechwood and black granite. For business travellers, there are special bedrooms which are furnished for holding meetings during the day. At night, staff will reveal a hidden bed and reset the room for you to sleep in. Thanks and happy travels to Susan Radcliffe for guest writing this post. Susan lives in London and is a qualified journalist with 5 years experience in writing for the media, including television, radio and the internet. Susan works for hotel comparison site sletoH.com (‘hotels’ spelt backwards!!) and its sister site Airport Hotels.com where her writing is designed to make airports interesting places! Love the Kempinski Munich. The Fly & Fly spa there is fantastic! Need to check out some of these other airport hotels. Cool article about airport hotels! Last summer I stayed for a night at the Renaissance Los Angeles Airport Hotel, what a service and what a hotel. I even got served with a bottle of champaign when I said it was my birthday, haha :P!